The Lents Grown Kiosk was conceived as a three sided corten steel structure representing business, community, and environment. Each of the panels has unique perforations laser cut out of the top, referencing patterns found in nature. These natural patterns represent the Oregon landscape and the agricultural roots of the Lents area. Juxtaposed with these natural patterns is the industrial nature of the steel panels that allude to the manufacturing found in the surrounding neighborhoods today. 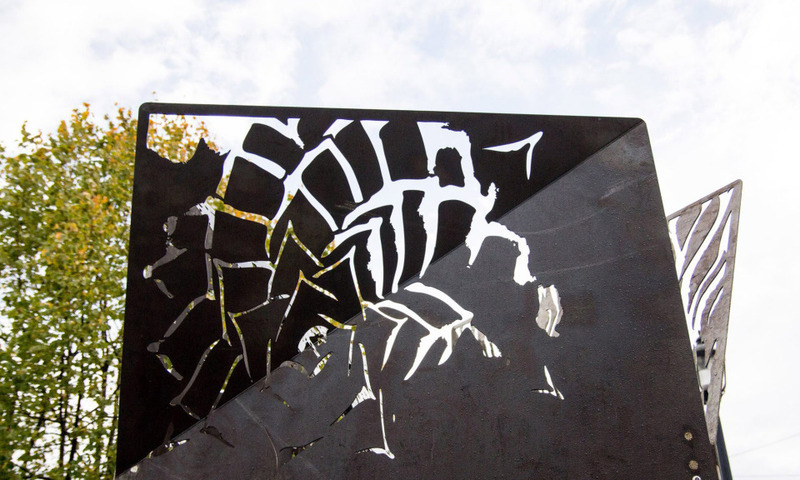 The use of corten steel has become an iconic element of the neighborhood, being used in many of the art installations, landscaping and sidewalk improvements, and signage throughout the area, including the Lents Neighborhood Entryway Landmark. The pin-up boards are illuminated day and night by a solar-powered LED system. This project is the second in a series of Propel Studio projects in the Lents Town Center, located just a couple blocks from Lents Story Yard.